All it took was a princess who battled her own identity, to help me confront part of my own. Summer Anderson, Be yourself. Everyone else is taken. As a young girl, I used to dream about which Disney princess I related to the most. Was I like Belle? A girl who loved books and wanted more in life than what people expected from me? How about Ariel? A girl who was fascinated with adventure and a life outside of the expectations placed upon young women? As I grew up, I realized that I was my own princess, one who made her own path in life, through both my struggles and triumphs. However, there is one princess who has helped me through one of my hardest battles. She gave me the strength to finally face one of my fiercest emotional fights head on, and to not shield it from others. 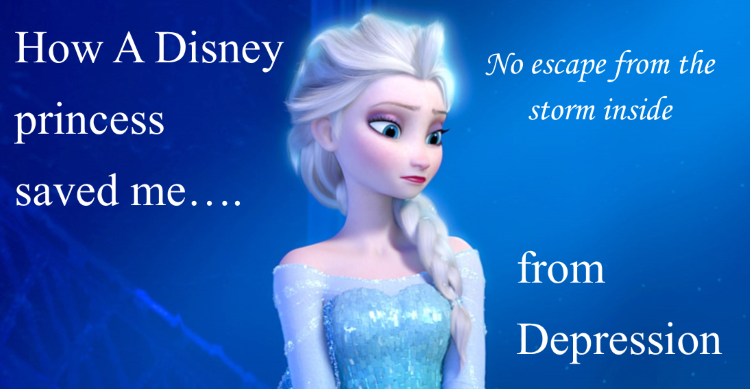 Here is my story on how a Disney princess saved me from depression. My whole life, I struggled with rough bouts of anxiety, depression, and uncontrollable thoughts that wouldn’t stop racing. Certain events would trigger my anxiety, and in turn, I would face these rough patches of anxiety and depression. Throughout my high school and college years, I could fight these bouts off on my own, usually by keeping busy or by pushing my thoughts into other endeavors. I never gave these moments a name, because I was afraid to address it and admit that there was something off with me. When I became a mom to my two little ones, my worries only got bigger and my hormones inevitably changed after being pregnant and giving birth. When I finally weaned my own year old off of breastfeeding, I didn’t realize it would also offset a force that I could not contain by myself. Simultaneously, during this rocky time, my two little ones formed a fascination with the movie, “Frozen.” It’s a story of a queen, named Elsa, who was born with cryokinesis powers, or the psychic ability to control the forces of cold weather. In the movie, Elsa was taught to conceal her powers, to not feel them because no one knew how to understand or help her effectively control them. “Conceal it, don’t feel it, don’t let them show,” was her motto as she grew into a young woman and took her role as queen. Her struggle to acknowledge her powers, let people into her life, and to hide away from those who loved her made me realize that I am doing the same thing in my own life. I was scared of facing my anxiety and letting people know that I have this condition. Watching Elsa face and accept her own identity, gave me the strength to seek help for my condition. I went to a doctor and I began to speak openly about my bouts of depression and anxiety with others. I never realized how many people had similar feelings, or that they also had to find outside help for it as well. I found comfort and relief in knowing that I wasn’t alone in feelings, especially after being pregnant. Those I loved stood beside me, and showed me that their love will not go away, regardless of my condition. Love and openness is a beautiful thing; One that can lead you to finding happiness and relief with yourself. It may be scary to face your condition, but inevitably, it’s what will ultimately save you. As Elsa said at the end of the movie, “love will thaw.” She was right, because love will melt away your fears and give you the strength to win the war against depression, and it will finally set you free and make you whole again. Mother. Wife. Daughter. Sister. Blogger. Aspiring Writer. Coffee Addict. Animal Lover. Promoter of Positivity. Dreamer. Millennial with a Mix of Baby Boomer.